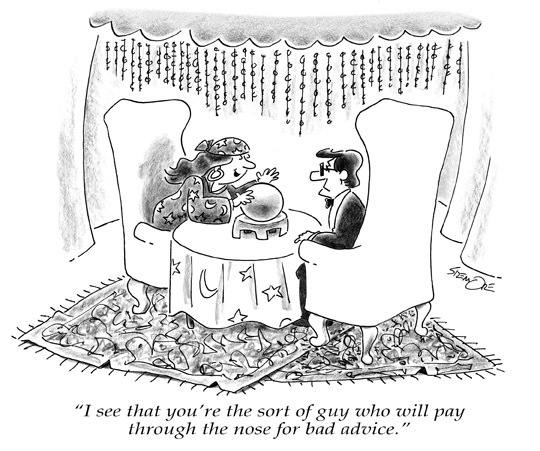 This entry was posted on Wednesday, March 12th, 2014 at 2:26 pm and is filed under advice, business, business as usual, business ethics, fortune telling, gag cartoons, gags, myths, relationships, scams, superstitions, wisdom-seeker. You can follow any responses to this entry through the RSS 2.0 feed. You can leave a response, or trackback from your own site. Lovely little drawing! I like the interior decorations (beaded curtain, oriental rugs–two! ), as well as the caption. The guy is well-drawn too. Mr. Money. Thanks for the insightful—and visually specific—comment. It’s very rare to get commentary directly on my cartoon posts, which makes yours all the more appreciated . . .